There is something magical or satisfying or comforting — and sometimes all three — about picking something you grew and eating it for dinner. I don’t know if farmers, big and small, feel that way after years, maybe decades of doing it. (Maybe some wish someone else grew their food.) But last night we harvested our first batch of purple sprouting broccoli, a variety that does well here in the wet and mild Pacific Northwest. My four-year-old used a “grown-up” knife to cut a dozen stems off the bushy plant. We took them inside, rinsed them, and sautéed them with a little olive oil, garlic, and salt. Then we ate them for dinner 10 minutes later. 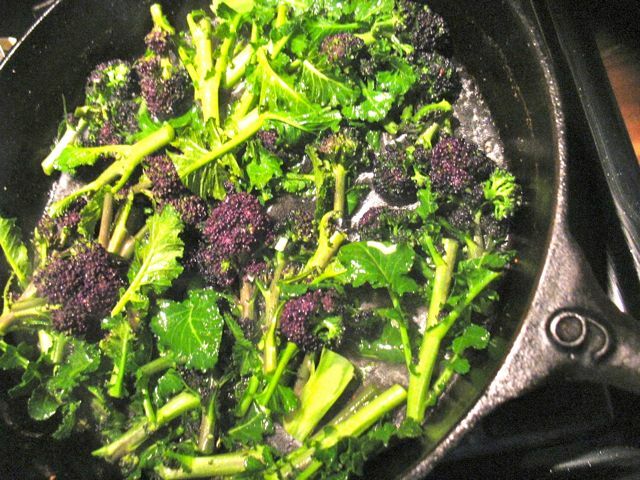 We can do that about three, if we’re lucky five, more times before our crop of purple sprouting broccoli will be gone. We likely would have gotten twice that many meals out of this crop if someone hadn’t yanked two of our four plants out of the ground a few months ago (this raised bed abuts the sidewalk, within easy reach of passers-by). Nevertheless, the percentage of our food that we grow ourselves is miniscule. Still, I love growing a bit of the food we consume. This time of year, when it’s still cold and wet and I’m wishing for sun so that my peas will germinate and the transplanted greens will take root, I think about the farmers all around who are investing every penny they own into growing food for us. For them, half the crop disappearing overnight would be no laughing matter. For them, the increasingly wild swings in weather keep them up night after night, thinking about which varieties might be the most adaptable, hardy, prolific, marketable, etc. And that’s why I purchase a CSA share each spring. As many readers know, the acronym stands for community-supported agriculture, which in theory means that if it’s cooler and wetter than normal, you may not get any peppers this year, but twice as many peas. More generally, though, it means that you invest in this critical business of farming with the farmer. It means you become, as Slow Food International founder and president [/author/Carlo_Petrini "Carlo Petrini"] would say, a co-producer. It means you take some responsibility for thinking about what it takes to put food on your plate. Which also means you get to be a little closer to that magic or satisfaction or comfort that growing something, or knowing the person who grew it, can provide. Not everyone has the opportunity or time or inclination to become a member of a CSA, but if you’re curious about it, I urge you to seek out your local CSA farms. Try it for a year. Some weeks, it will seem like Christmas in a box, and some weeks, it might be overwhelming. You’ll likely spend less money than you would otherwise, even if the up-front cost can seem steep. And you’ll likely become a more creative cook. If you can’t use up all the produce, I’m sure a neighbor will help you out. Here in Portland, there's an organization called Portland Area CSA Coalition (PACSAC), which has an invaluable website that, with the help of Local Harvest, collects all of our regional CSA options in one place; other regions may have such sites as well. Also, local newspapers and magazines sometimes publish lists this time of year. So look around, ask around, and see what CSA options you can find.